WordsUp! Academy is a downloadable only hand held video game on the Nintendo 3DS. This 3DS video game is selling for $2.99. WordsUp! Academy is only a couple of hundred blocks so it should not tax your Internet plan too much to download this brain game. You will use your brain playing WordsUp! Academy on the Nintendo 3DS. This game gives the player so many letters and expects them to spell as many words as possible. Players can sort the letters around, and even get a whole new set of letters in WordsUp! Academy. There is a Story Mode, Versus Mode, Free Play Mode, Classic Mode, Blitz Mode, and Relax Mode. Every single time I played WordsUp! Academy it asked me if I wanted to play online or not. Knowing how damaging it is to play online I told this hand held game no. 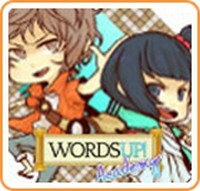 I am thankful Family Friendly Gaming was provided a download code for WordsUp! Academy on the Nintendo 3DS. This is one hard word game that will be defined as niche by quite a few people. In fact playing WordsUp! Academy is a great way to humble yourself. I did not find any clues or assistance when I got stuck. In fact after many hours of game play I was not able to beat one part of WordsUp! Academy. WordsUp! Academy can lead to real world frustration. The graphics are nice, and the music is fabulous. I loved listening to the special effect sounds in WordsUp! Academy. I wish I could have seen more of the story in WordsUp! Academy. Ultimately this game is above and beyond any word game skills I have. Casual gamers will most likely get irritated, and frustrated from playing WordsUp! Academy. Which is a shame because this is an educational kind of a game. I wish WordsUp! Academy had some beginner, or entry level section. I went to the relaxed area and played until I could think of no more words. Sad part is there were all these other words the game wanted me to include. I sorted the letters and sorted the letters. My blank stare for hours was an indication that I was not going to get anything new. I even tried reading a dictionary. That did not help me either. If you are looking for the most challenging word game I have played in my life, and you download video games on the Nintendo 3DS, then check out WordsUp! Academy. I warned you this game is hard. So do not email me crying that it was too hard. You were given ample warning.